The powder used is designed for minimal muzzle flash and the primers are triple-inspected during the manufacturing process to ensure reliability. This product is brand new, nickel-plated, boxer-primed, non-corrosive, and reloadable. 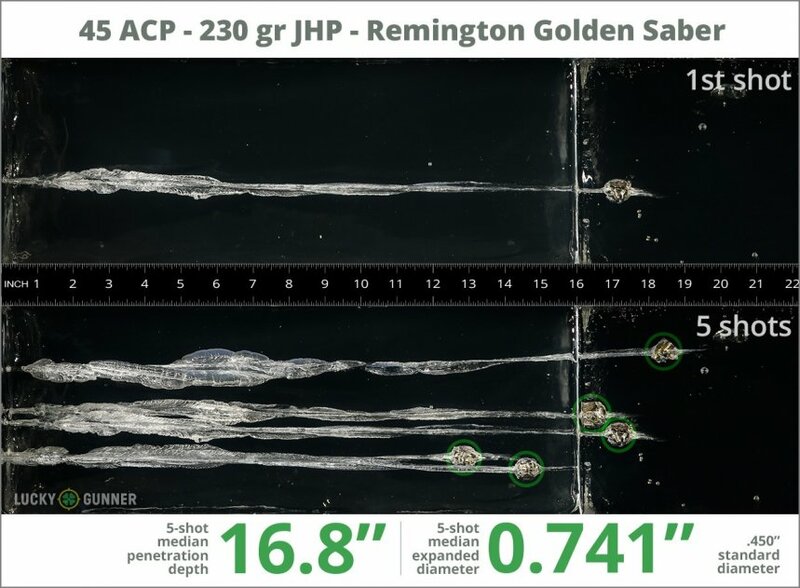 We test fired five rounds of .45 ACP (Auto) Remington 230 gr Golden Saber into synthetic ballistic gelatin to observe its expansion and penetration characteristics. The ammo was fired from a Kahr CW45 pistol at a distance of 10 feet. A four-layer barrier of heavy fabric was placed in front of the gelatin to simulate clothing. 1.04" This ammo: 0.74" Min: 0.45" Median: 0.64" Max: 1.04"
16.8" 0" 8.3" 16.7" 32" This ammo: 16.8" Min: 8.3" Median: 16.7" Max: 32"
The Remington Golden Saber 45 a.c.p. 230 gr. is duty issue ammunition for my agency, the Lucky Gunner testing confirms that this was a wise decision. This is by far and wide the only Ammunition I would ever choose carry. It is loaded in every defensive weapon I own. eg: 38 Special, .357 Magnum, 40 S&W and yes the venerable tried and true 45 ACP. Although I do not own the ever popular 9MM I would have utmost confidence is this round's effectiveness. I have always been happy with LG, they have quality products. This last batch of Remmington Golden Saber ammo works great and I did not expect anything different. LG staff make sure I get the latest updates on sales and equipment. Always buy LG products. Found this to be excellent ammo, no problems. I have yet to compare it to Hornady Critical Defense ammo but so far pleased with the Remmington ammunication. Pretty good ammo, shoots clean and no miss-feeds. Great Service and Quality ammo. Ammo arrived quickly and in great shape. Price was good for the ammo. Performed flawlessly in my Sig 227. I will definitely buy more. No failures nice groupings. This is my preferred defensive round. Always pleased with Lucky Gunner service. Picked up a box of Golden Sabers to continue my JHP trials with the HK45. My current favorite is still the Federal HST LEs, but these are a close second, beating the Hornady XTPs and Speer Gold Dots. I'm going to do another side by side comparison of the Sabers to the HSTs, but based on the first test, they are pretty much equal accuracy wise and neither have had an FTE/FTF. Overall, great round, solid accuracy, quick follow up shots and goes bang every time I pull the trigger. Can't ask for anything more in my opinion. I highly recommend this Ammo. It is extremely accurate and reliable. 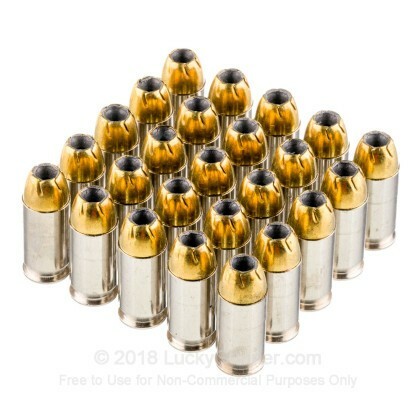 I went and bought 25 rounds of this ammo and fired about half through my 1911 champion. The rounds fed well and ejected well, the only problem I had was the last round wouldn't eject properly and I blame that on my old springs and not the ammo itself. The cost per bullet is decent, but at the same time u get what u pay for. Also this ammo burns clean and completely. If given the chance I would buy this ammo again and I also would recomend it to others. 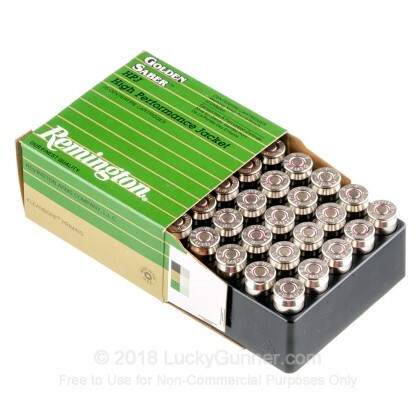 Purchased several boxes of this ammo, four boxes had one round in each box that the bullet wasn't seated in the case to the proper depth. It was barely pressed in the case! Remington replaced them. 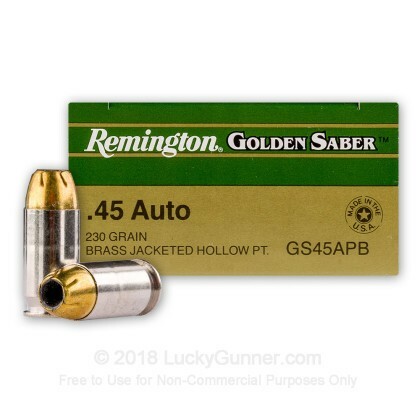 Also purchased a case of the Golden Saber 9MM 147 gr. Bonded, 6 boxes had one round in each box that the nose of the bullet wasn't tapered to the proper diameter. The hollow point mouth was much larger than it should have been, you could literally stick a correct round inside the nose of the flawed round! And this ammo is going to law enforcement! OY! Make sure you open every box of Golden Saber and look at eye level, to be sure ALL, the rounds have uniform height. 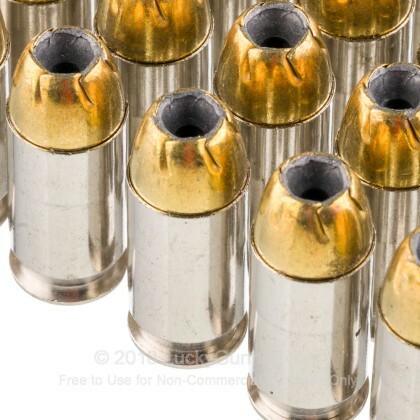 If you notice some rounds set higher in the plastic case, you either have improper bullet depth, or, the nose of the bullet isn't tapered to the correct diameter. In both examples, the round will set higher in the plastic case than the rounds that are in spec. Rated a 5 on quality because I have not shot it yet, but, quality control I rate a 1. Got several boxes today from LG and it showed up exactly when they said it would. I had a hard time finding this at other sites and when I did the price was way higher. You guys rock!!! You have in stock what no one else out there does, best ammo site on the web!!! Went through 75 rounds at the range and not a single miss feed, while my hydra shocks miss fed left and right. Perfect and reliable home defense round for your 1911 and at a fair price. Shot the +P version of this round also and nothing but love. Remington has gotten it right! I have had no feeding problems with this ammo with a gold cup colt, 2 Kimbers (1full size, 1 carry). Both Kimbers I use to have feeding problems with just about anything you fed it. I had both bore ramps polished and the will eat anything now. I have a KRISS and a JP carbine both in 45 cal that loves this ammo. The Golden Sabre line has proven to be reliable and accurate in practice, so I trust it and prefer it for carry. The +P series have the most optimal balistics for the 45 acp but the 230 grain standard load have been great to practice with and are more economical. These rounds feed flawlessly through my p220 and Kimber and accuracy has never been an issue. I highly reccomend this line of ammo for defense. I'm running a Kimber Raptor II using Wilson Combat's new ETM 500B with a 20# Wolff spring and VZ Recons for grips. I had some FTF problems with some Federal 185 gr Hy-Shok (not a misspell - older LE ammo) which has a truncated cone profile. I wanted to try some JHP ammo with an ogive. I purchased this, the 185 gr Golden Saber and the Federal 230 gr HST JHP. Opinions are strictly subjective. In rank order of preference I found the 230 gr Golden Sabre to have the softest recoil of the three and appeared to be most accurate. Next would be the 185 gr Golden Sabre and last being the Federal HST JHP. All fed reliably, so I was very happy with my ogive experiment. ALL three are controllable, none unpleasant. While not purchased from LuckyGunner, I've fired the Hornady 185 FTX Critical Defense and to me this would cause too much muzzle blast and likely ultimately flinching for me to consider as a SD carry round. LuckyGunner shipping was prompt and everything was as expected. I think they're doing a great job of living up to their promises. Ammo has always performed flawlessly in my Glock 21 and Glock 30. I am retired law enforcement and continue to count on it as my primary defensive round. I have tried this in my Kimber cdp, H&K usp compact, Kimber pro carry, Springfield xdm. All feed reliably and are quite accurate. 3 Inch groups at 25 yards on a sandbag. I have not tested them on barrier performance. - Speer Gold Dot 230 gr JHP .... 3 misfeeds in two seven round magazines (Speer says it's probably my pistol). BS. 21.4%% failure rate ... So, I tested other brands. - Federal Premium Hydra Shok 230 gr JHP .... No misfeeds but suspicious since ATK owns Federal & Speer and I don't trust Speer. 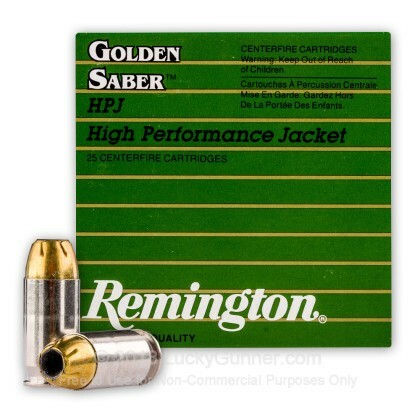 - Remington Golden Saber 230 gr JHP .... One misfeed in 3 magazines (21 rounds). 14.3 % failure rate. - Winchester PDX 230 gr JHP .... No misfeeds. - Hornady XTP +P 230 gr JHP .... No misfeeds. Conclusion: I will carry Hornady or Winchester. Cannot recommend the other brands. However, I can recommend Lucky Gunner. All my orders (several thousand rounds mostly in case lots) have been handled as expected and promised. Good prices. I settled on Golden Saber after trying a lot of the other brands of defensive ammo. Cycles well in my 1911s, consistently very high quality. 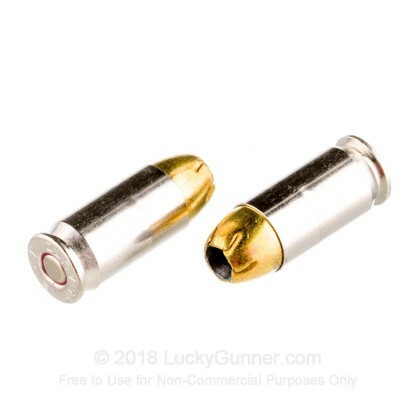 Lucky gunner has great prices which allows me to buy in bulk so I can test fire and keep fresh ammo in my carry guns. quality,value and performance at its finest. well invested money for protection for the family. Shot perfectly. Quality product. Will use for SD. Will Buy Here AGAIN !!!! Excellent product not seconds. Great price! Easy people to work with. FAST SHIPPING ! !